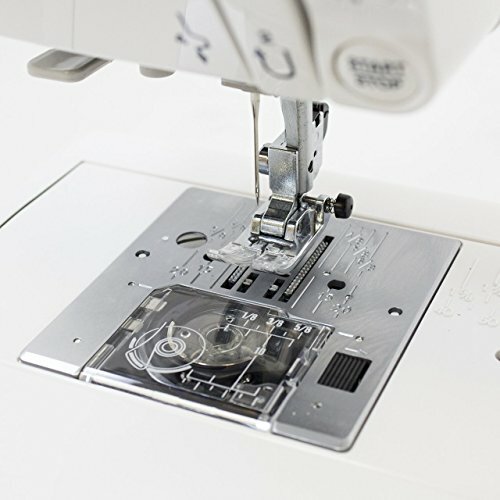 The 8077 computerized sewing machine from Janome is an excellent choice for sewers seeking a machine that’s both budget-friendly and technically advanced. Features including an LED screen, automatic needle threader and bobbin winder, and a selection of 30 practical stitches make the 8077 stand out from its competitors. In addition, this computerized machine is lightweight and portable so you can conveniently bring it wherever life takes you. Getting set up to sew simple thanks to the automatic needle threader, auto-declutch bobbin winder, and simple stitch selection. These features relieve the need to prepare the machine by hand and will save you a great deal of time. The 8077 is lightweight and portable to give you the flexibility to sew in multiple locations. It weighs just 18 pounds and can fit in a suitcase for sewing on the go! The LED screen on the Janome 8077 takes the guesswork out of making stitch selections. This clear, bright screen makes the 8077 user-friendly and keeps the sewing process precise. The Janome 8077 performs only basic stitches and can’t produce decorative stitches for more complex, advanced projects. A protective cover or carrying case isn’t included with your purchase of the 8077, which can make moving and storing the machine an inconvenience. The maximum stitch width is 7mm, which is somewhat low compared to other models. This limit may pose an issue when completing a blanket stitch or other technique that requires greater width. The Janome 8077 has your sewing projects covered with 30 thoughtfully selected, built-in stitches. This wide selection of stitches is perfect to complete basic sewing projects, whether you’re a beginner or have extensive sewing experience. Selecting the perfect stitch is straightforward with this awesome machine. Simply refer to the front stitch panel for the number that corresponds to your desired stitch and use the LED screen to select that number. 6 one-step buttonholes are included in the stitch selection. This makes sure that the buttonhole you sew is the perfect size for whichever button you’re working with; it’s perfect for sewing buttons on coats, pants, dresses, and more. Tying off stitches at the end of a row can be a serious hassle. The 8077 takes care of this for you with a locking stitch button--just another way this machine makes sewing quicker, easier, and more convenient. 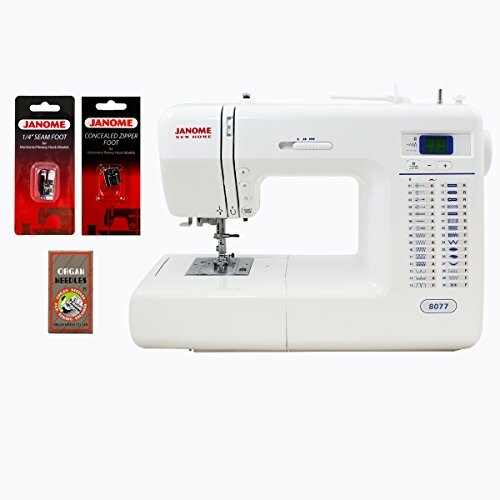 This sewing machine from Janome has a maximum stitch width of 7mm and a maximum stitch length of 5mm. You can adjust the stitch length and width with accuracy simply by pressing the plus or minus sign displayed on the LED screen. Memorized needle up/down: This feature allows you to set the needle so it will always stop either in the up or down position. Do you prefer the needle to stop up so you can adjust the fabric, or would you rather have it stop down so the fabric stays in place? The memorized needle up/down allows you to set the machine to your liking and make an adjustment whenever you want--with just the push of a button. Automatic Needle Threader: Struggling to get your thread through the eye of your needle? All sewers have been there at one point or another. Well, struggle no more with the automatic needle threader included in the 8077--this feature will save both time and frustration. Two-Digit LED Screen: The backlit LED screen on the 8077 makes selecting your stitch, width, and length effortless. Use the clearly labeled navigation keys to make your selections and get started on your project ASAP. Superior Feed System: Janome has developed the Superior Feed System and incorporated it into the 8077 model for ultimate ease of use. This advanced feature makes for an extremely precise feed and pressure control. Free Arm Feature: Repair or create clothing in a snap with the free arm feature. This included addition makes maneuvering pant legs and shirt sleeves a breeze. Start/Stop Button: You can easily sew without the use of a foot control with the 8077 by using the stop/start button, conveniently included with the central control buttons. Reverse Button: No need to worry about manually rotating your fabric with the 8077’s reverse button! Flip your direction in a second by pressing this centrally located button. Auto-declutch Bobbin Winder: Spend less time winding bobbin and more time sewing with the auto-declutch bobbin winder. The auto-declutch will stop the motion of the needle and start winding your bobbin if you simply move the bobbin winder to the right. Precision Tension Dial: The 8077 includes a precision tension dial that allows you to manually set the thread tension at the perfect level for the stitch and material you’re working with. By using this feature, you won’t have to worry about the fabric bunching or puckering. There are plenty of great accessories that come standard with the Janome 8077. 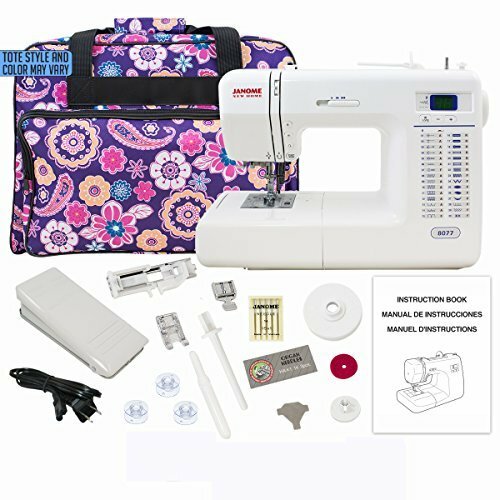 These extras will expand the potential of your sewing projects and help you get off to a fantastic start right when the machine comes out of the box. One-Step Automatic Sliding Buttonhole foot: Sew on buttons with ease using this top-of-the-line buttonhole foot. Zipper foot: Need to sew a zipper onto that handmade dress or pair of pants? The 8077 makes it easy to do so with the included zipper foot. Satin Stitch foot: Satin is one of the trickiest fabrics to sew, but also one of the most beautiful. With the 8077, you can sew this gorgeous fabric with ease using the included satin stitch foot. 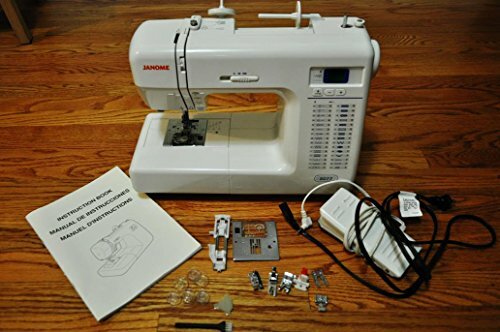 The Janome 8077 is an affordable mid-range computerized sewing machine. Several customers rave that the 8077 is a great value for money; the number of features it offers when compared to other products in the same price range is remarkable. Janome is a trusted name in the sewing machine market, so you can count on the 8077 to deliver on quality and durability. For under $400, this machine is undoubtedly a great deal for all types of sewers; it combines affordability with high-end features like the LED screen and Superior Feeding System. Overall, the Janome 8077 computerized sewing machine is a mid-range option for those seeking a mix of advanced features and value. Both sturdy and portable, this model has the technical capacity to fit the needs of advanced sewers but is user-friendly enough to suit an eager beginner. The 8077 deserves the glowing reviews it has received from customers and is certainly worth your consideration.